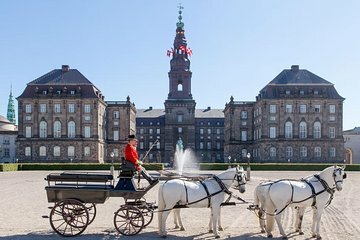 Christiansborg Palace is a must-see sight in Copenhagen, and a working palace that is very important to the Danish Royal Family. With this handy admission ticket you’ll gain access to various parts of the palace, and get a peek behind the scenes. As well as the grand reception rooms, you can check out the kitchens, stables, and the quarters that help the palace function. You can also join a guided tour, to learn more about Denmark’s history and culture. The Royal Reception Rooms: Entrance from Prins Jørgens Gård or the inner palace courtyard. The Ruins: Entrance from the inner Palace Courtyard. The Palace Chapel: Entrance from Christiansborg Slotsplads. The Royal Stables and Carriages: Entrance from Christiansborg Ridebane. The Theater Museum: Entrance from Christiansborg Ridebane. The Parliament: Entrance from Rigsdagsgården. Every day during opening hours: In Danish at 11 am, in English at 3 pm. Every day during opening hours: In Danish at 1 pm. Every Saturday: In English at 4 pm. Every Sunday: In Danish at 4 pm. Every Saturday: In English 12 noon. Every Sunday: In Danish at 12 noon. Every Saturday: In English at 2 pm. Every Sunday: In Danish at 2 pm. Please notice that the horses are turned out to graze on summer pasture in North Zealand, from the middle of June to the middle of August. Every Sunday in July at 2 pm. Combi ticket holders can take a royal journey through history, by joining the guided tour 'Highlights of the Queen's Palace'. The tour will take guests through the Royal Reception Rooms, the Royal Kitchen, the Royal Stables and the Palace Chapel.